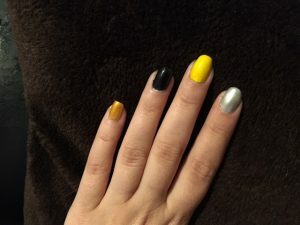 So, in the last post, we covered off the three basic stripe/French mani designs for our ‘Harry Potter inspired nail art. 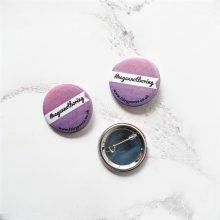 In this one, we’re covering the designs that are a little more fancypants! On the middle finger – for Hufflepuff – we’re going to slather a healthy layer of ‘Jaune’ from the ‘Paintbox’ collection. This golden-tone yellow is just perfect to reflect the bright, sunshiney spirits of every lovely, loyal Hufflepuff out there! Now – the house colours for these lovely sorts are in fact yellow and black. The problem is that yellow and black are recognised by most of us as a combination signifying danger or a warning. To add some fun and give it that element of easy-going Hufflepuff happiness, I decided to go for a bubbly look – literally! Swipe a nice thick layer of ‘Noir’ – our gorgeous gel-effect black – from the same ‘Paintbox’ polish set, then use a dotting tool/hairpin to make a couple of LARGE blobs along that dividing line. 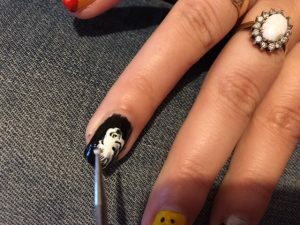 As you move down the nail, make those blobs gradually a little smaller. You can use basically anything with a narrow/pointed end as a dotting tool. A hairpin, a pencil, even a very thin chopstick (you could use a pencil sharpener to narrow it down even more). 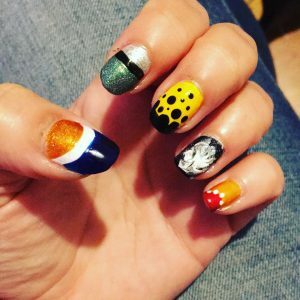 Hey presto – from the universal colours of danger, we’ve created a fun, bouncy, bubbly piece of nail art fit for a Hufflepuff! The ring finger – the patronus – this is the one you’ll need to have a little patience with. 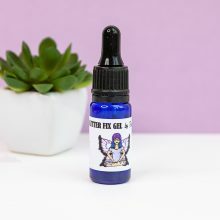 Firstly, you’ll need to have a small dotting tool, pin, needle or cocktail stick at the ready – something with a SUPER thin end. Lay down a layer of ‘Noir’ and let it dry. It’s important that you allow it to dry, because otherwise you may end up with some bare nail showing through after the next step. Next, a good, SUPER thick layer of ‘Noir’. Thicker than you would normally use but not heavy enough that it’s dripping off your fingertips. While that’s still wet, drop on a good, healthy blob of ‘Blanc’. Use your skinny implement of choice to make a couple of swirls around those edges while it’s still wet. My aim here was to create a ghostly-looking ball of light. Ethereal and interesting. I added in a tiny blob of ‘Katherine’ from the Metallics collection too, but that’s optional. Once your little ring-finger patronus shape is to your liking, just leave that to dry! 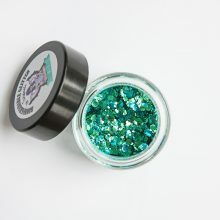 The gigantic difference between Fairypants nail varnishes and other brands is that they are SUPER quick to dry, so even with that mega-thick layer of polish on your nails, you just need to hang tight for about 10 minutes to let the pattern set. 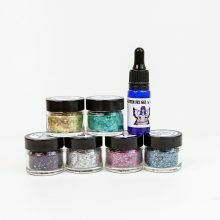 I added in a swipe of our silver holographic glitter polish, ‘Moon’ as well, right over the white part. You can’t go wrong with a little extra sparkle – amirite? Voila! You have got yourself a sassy Hogwarts-appropriate mani! 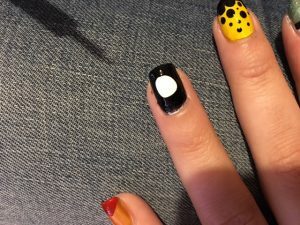 This entry was tagged beauty, black, cruelty-free, gel, harry potter, mani, metallic, nail varnish, nails, tutorial, vegan, white, yellow. Bookmark the permalink.